Friday November 10th 1899 We did churning this morning and cleaned the milk house and cellar today. It was a nice day and we made the most of it. Saturday November 11th 1899 Will took the butter to town and was over to Woolfs for dinner. Julia and I finished cleaning the yard and tried to make a platform between the milk house and the kitchen doors. We did not get it quite done I read some in the evening. Sunday November 12th 1899 I was busy about the work all forenoon. Julia went home for good. Henrys family was here a few moments in the afternoon and later Mr Ballard and Esther came Earnest & Jennie with Mary Woolf came over and they all stayed till after supper. We enjoyed it very much. Monday November 13th 1899 I was very busy all forenoon. I [stowed] pumpkin and did some extra work up stairs. In the afternoon I started up to see Mrs Gregory and met her coming down to Simpsons I went on down with her. 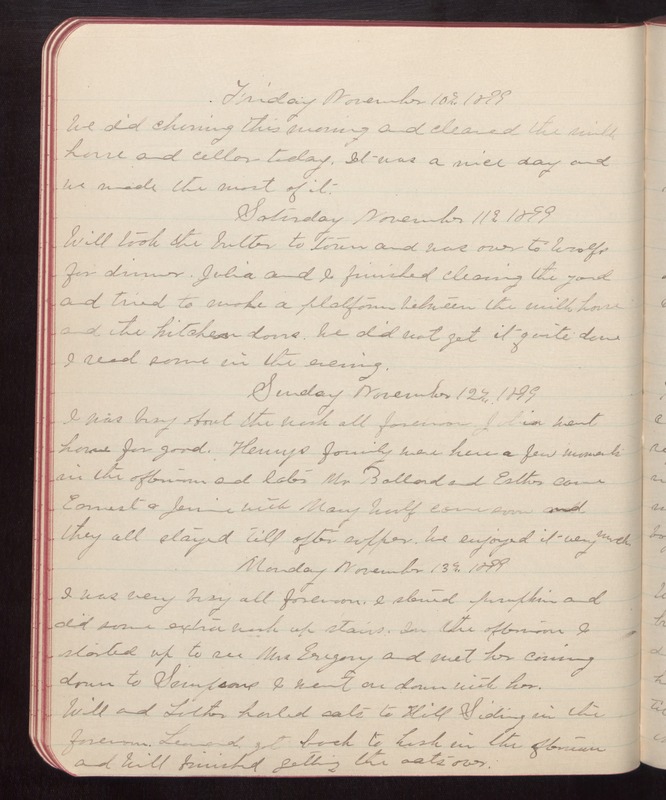 Will and Luther hauled oats to Hill Siding in the forenoon. Leonard got back to husk in the afternoon and Will finished getting the oats over.